There were shots of Wild Turkey, musical tributes—and many, many laughs. More than 5,000 Southwest employees, retirees, and invited guests celebrated the life and legacy of Herb Kelleher on Tuesday at the Kay Bailey Hutchinson Convention Center in downtown Dallas. Fittingly, boots and jeans far outnumbered the suits and ties in attendance. 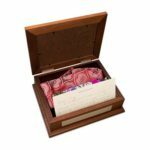 One retiree’s vintage Southwest Airlines t-shirt read: “I don’t want to grow up—that’s why I work for Herb.” And in true Kelleher fashion, there were reliably more laughs than tears during the two-hour memorial. 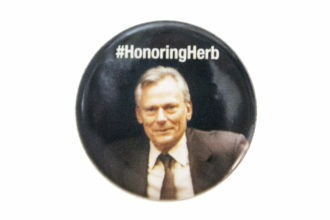 A pin given out at the celebration of the life of Herb Kelleher. As you’d expect from the a dependably on-time airline, the service started promptly at 10 a.m. 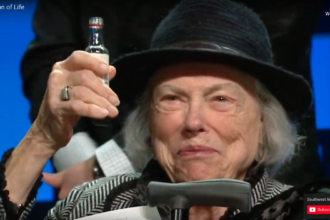 Longtime sidekick Colleen Barrett, president emeritus of Southwest Airlines, needed a cowbell cutoff reminder to help keep the service on time. 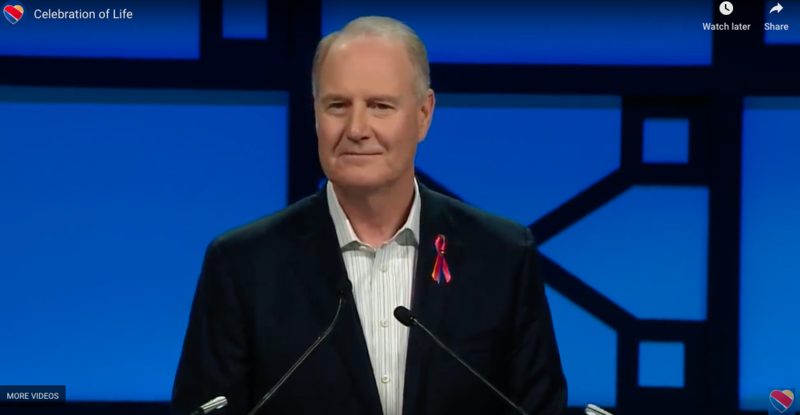 “When you’ve worked with someone for 51 years as I did, it’s almost impossible to put these stories into any kind of sequence … [after the cowbell] no matter where I am in these stories, I’ll just stop and go to my closing remarks. Otherwise, we’d probably be here until tomorrow,” she said. 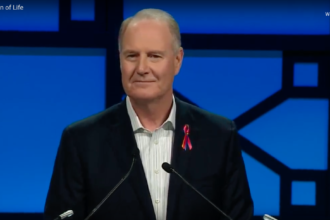 Barrett shared stories of Kelleher’s early years in business. First, as Herb’s dutiful secretary at a “stodgy” law firm in San Antonio, and then following him over to the “fun” firm Kelleher founded. She shared tales of his disdain for file folders and the time he lost his briefcase on the way to a meeting of the Conquistadores del Cielo (Conquerers of the Sky), a secret club of top airline and aerospace executives that Kelleher was initiated into in 1990. “It’s funny that a lot of Herb stories begin with booze or women, or both,” Barrett joked. 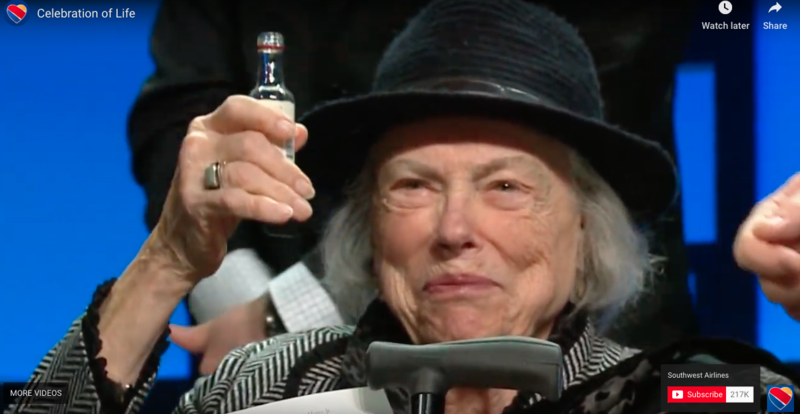 Following stories by Kelleher’s work wife, Herb’s real wife of 64 years, Joan, and the Kelleher clan—including Herb’s daughter Ruth, who is affectionately known as “Herb in a skirt”—took the stage to toast their father’s life with a swig from Wild Turkey minis. A close-up of the camera on Joan, as she sipped the whiskey and felt the slow burn of the bourbon, was a crowd pleaser. Fort Worth native and musician Gary Morris performed “Wind Beneath My Wings” and led the audience in a rendition of “America the Beautiful.” Other speakers included an invocation by Maria Dixon Hall and a story of how Kelleher became co-commander of the U.S. Air Force—or “Co-Co” for short—by retired general Duncan McNabb. It was Ron Ricks, vice chairman of the board at Southwest, who relayed the story of the founding of the airline on a cocktail napkin (which may or may not be myth), and the David vs. Goliath tale of stopping a temporary retraining order by Continental Airlines in order for Southwest Airlines to officially take flight on June 18, 1971. Though Ricks admitted Kelleher never told him the exact details of how he managed to assemble the Texas Supreme Court the day before Southwest flights were to begin to overturn the restraining order, he said “reliable sources” confirm seeing Herb and the justices in a dark bar off South Congress Avenue in the wee hours of the morning on June 17. 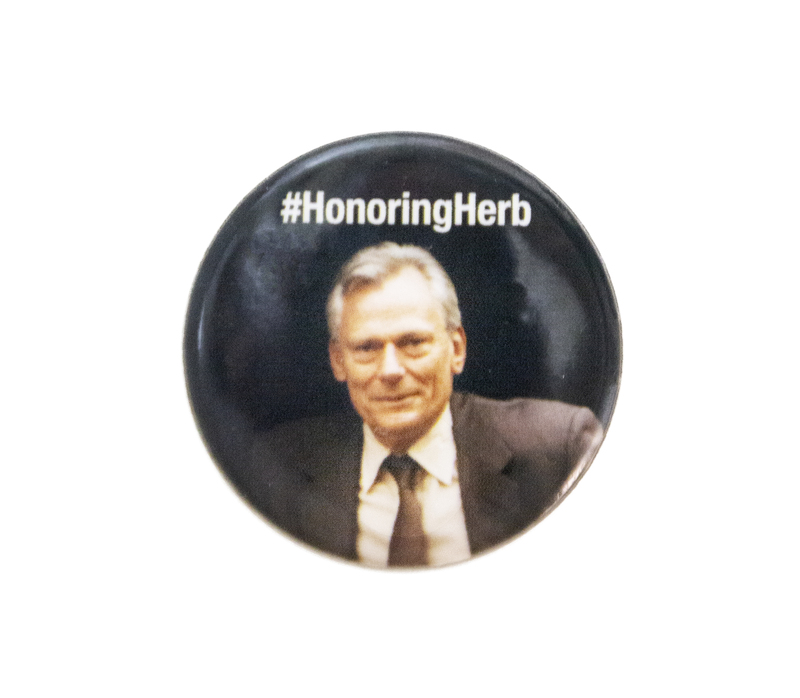 If you missed out, a full video of the event will be available at HonoringHerb.com for the next 30 days.